The eye is made up of many individual parts, which all work together in order to enable us to see. 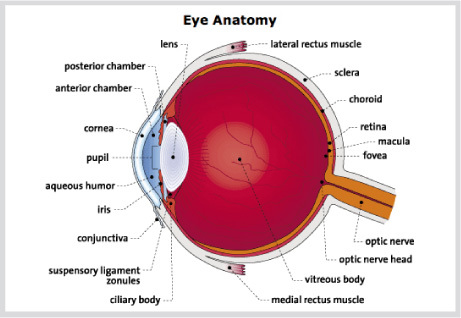 Below is an outline of the different parts of the eye, their position within the eye and their function. Light is essential to our vision. It bounces off of all the objects that we look at. We see when light reflects from different objects around us passes through the cornea and enters the eye via the pupil. The light, which has already been refracted by the cornea, is then directed towards the retina, at the back of the eye, by the lens where it forms a clear image. Due to the laws of optics, the image formed on the retina is actually upside-down. It is important that the correct amount of light enters the eye. If too much light is let into the eye retinal damage could occur. However, if too little light passes into the eye then sight becomes difficult. In order to regulate the light levels entering the eye, the size of the pupil is adjusted by the iris. The tiny muscles that make up the iris, known as the circular and radial muscles, relax and contract to maintain a fairly constant level of light entering the eye. In bright light, the circular muscles contract whilst the radial muscles relax. This causes the pupil to constrict and less light enters the eye. In dim conditions the opposite occurs. The circular muscles relax and the radial muscles contract, causing the pupil to dilate and allowing more light to pass into the eye. Although the cornea does the majority of the focusing, it is unable to vary the extent to which it refracts the light. Unlike the cornea, the lens has the ability to change shape and therefore alter the degree to which it refracts light. So that we can focus on both objects that are close to us and objects that are far away, the lens adjusts the focus so that a clear image is formed on the retina. In order to clearly see an object that is far away from us, the ciliary muscles relax. This causes the zonule fibres connecting the lens to the ciliary muscles to stretch, and as a consequence the lens flattens. The opposite happens when focusing upon an object that is near to us. The ciliary muscles contract, lessening the tension in the connecting zonule fibres and causing the lens to become more convex and round in shape. The iris, the coloured part of the eye, varies in colour from person to person. These colour differences are determined by the amount of melanin present in the iris. Melanin is a type of insoluble pigment present in all types of animal life. In general, the darker the eye colour the more melanin present in the iris. Dark brown eyes have the most melanin, whereas blue eyes have the least. Melanin plays a vital role in protection against the sun, hence why paler-coloured eyes have only evolved in cooler climates. There are some people that have different coloured eyes. The medical term for this condition is heterochromia iridium, it is quite rare in humans and is thought to be the result of an alteration to one of the genes that dominates eye colour. Blinking – the action of opening and closing the eyelids helps to keep the eye clean and lubricated. It is estimated that the average person blinks twelve times a minute. Tear production – tears are produced by the lacrimal gland and are the basic cleaning fluid for the eye. They wash the eye clean of foreign bodies and contain enzymes that help to protect the eyes from bacterial attack. The conjunctiva – a thin layer that covers the outside of the eyeball at the front of the eye forms a natural barrier to external dangers including smoke, bacteria, allergens, as well as the potentially damaging effects of the sun and the wind.